One of the first "green" buildings ever to be built on any university campus, SSU's Environmental Technology Center (ETC) has been in operation for 10 years. Come celebrate its anniversary on Friday, April 20 from 3:30-5:30 p.m. in the ETC. Congresswoman Lynn Woolsey is planning to be on hand to present a Congressional Record Insert commemorating the 10-year milestone and say a few words of congratulations. The celebration is free and open to the public. The ETC was originally the brainchild of Rocky Rohwedder, professor and chair of the Environmental Studies and Planning (ENSP) department. He along with Professor Jean Merriman Falbo (now retired) worked to obtain grants from the National Science Foundation (NSF) and California Energy Commission that provided the vast majority of the funding for the building. "We were definitely cutting edge at the time" noted Rohwedder. "The rapid escalation of green building activity over the last decade clearly shows we were far ahead of the pack." The ETC was recently featured in an building industry trade publication as one of the countries "Zero Energy Buildings" because it actually generates more energy than it consumes. 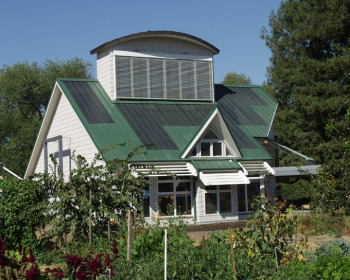 Built with the purpose of being "the building that teaches," the center utilizes sustainable building techniques and technologies that minimize its energy use and promote the capture of renewable energy. Systems include roof integrated photovoltaics, advanced window systems, extensive use of daylighting, recycled materials, and thermal mass. The ETC opened its doors in the fall of 2001 as an education, demonstration, and resource center. Today it is used as a classroom for the Environmental Studies and Planning Department and several sustainable certificate programs as well as a center for service learning and community-based research. Come early to the April 20 celebration and check out Habitat Day in the on-campus garden right outside the ETC. At 3:30 p.m., the ETC doors open to start the celebration that includes refreshments, garden and building tours and a student project showcase. Professor Rohwedder is also very excited that 24 photographs from Douglas Gayeton and Laura Howard-Gayeton's 'Lexicon of Sustainability Project' will be on display at the anniversary celebration. "The Lexicon Project is based on a simple premise: people can't be expected to live more sustainable lives if they don't even know the most basic terms and principles that define sustainability," said Douglas. The Gayeton's have been working on this project all over the US for more than three years. Douglas, a filmmaker, photographer, and writer takes stop motion photographs of leaders in food and farming and then defines sustainability terms on the finished photograph. He has interviewed and photographed over 100 people for his 'information art' photo collages. Google has a permanent installation of his work in their cafeteria and his work has also been featured in TIME and National Geographic as well as in numerous museums and private collections around the world. "The Lexicon Project will educate, engage and activate people to pay closer attention to how they eat, what they buy, and their responsibility for creating a healthier safer food system in America." Visit www.sonoma.edu/etc to learn more about the Environmental Technology Center and www.lexiconofsustainability.com to learn more about Douglas Gayeton's photographs. New sustainability efforts are underway on-campus, driven by student feedback and consultations with Associated Students, Inc. (ASI) and Sonoma State Enterprises (SSE).